Everything Changes – The Guide to Young Adult Cancer » Does Making Art Help You Deal With Illness? Does Making Art Help You Deal With Illness? For me, there has always been a strong dividing line between art for therapy sake and art with a capitol A. The difference is an audience. I gushed my cancer story into 12 journals during treatment. Scribbling in a notebook was great for getting cancer angst out of my system. But hammering out these rants was a quite different process, and created a different product, than crafting the manuscript for my book Everything Changes. One had an audience, the other did not. Recovering from surgery, two summers ago, I was doing a choreographic residency. Blasting Led Zeppelin and stomping around the studio with my stiff, post-surgery neck helped me accept my incurable cancer. 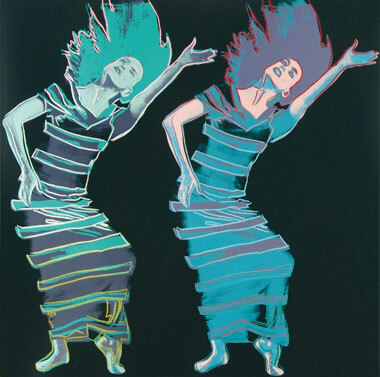 But improvising in the studio was a very different act than choreographing the ballet-opera that became the final performance of my residency. At times being an artist with cancer is a mind f***. The cons: I want to write and choreograph about something other than my disease, but cancer so often enters my work even when I don’t want it to. I also hate when people assume that my cancer was a great artistic opportunity. I was a damn creative person before my cancer and didn’t need this diagnosis to provide content for my work. Nor do I want an audience to feel cornered into empathizing with my experience of being ill. But there are also pros: A life in the arts prepared me for how to live very frugally – helpful when you are young with a pre-existing condition. I’m a really expressive person – quite useful when you are trying to communicate with doctors, and friends, and family about your needs. And, I have a job that is fulfilling and provides a major distraction from thinking about cancer. Well…. except for the fact that I keep writing so much about cancer. I yearn for an art project, craft, or a hobby that is totally unrelated to health. Some days I wish I knew how to knit. But I fear that if I did I’d just end up knitting hats for chemo patients. After treatment, I took a class in techniques for transferring photographs onto fabric. I have never done anything at all with this artistic skill. What a remarkable, relaxing relief. Do you have any crafts that distract you from your cancer? Is your profession related to cancer, illness, health care? If so, how do you find balance? Do you enjoy seeing or hearing music or artwork made by artists with illness, or is it not relevant to you? Listen tonight to the Stupid Cancer Show when I interview artists and cancer patients Seth Eisen and Christina Falise. 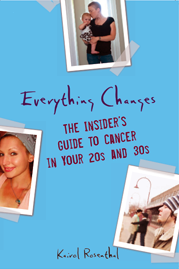 For more about my life in the studio with cancer, read my book Everything Changes: The Insider’s Guide to Cancer in Your 20s and 30s. One I am a writer also. Two, I work in the medical field and I deal with Cancer patients at least once a day. It makes me a bit more compassionate to those patients having an idea about what they are going through. Also, I see someone wearing a Livestrong bracelet and I wear mine I use that as a way to connect with a patient being a fellow caner survivor. But as far as the art goes. I never have had that problem, maybe it is because I have been eight years clear and never wrote anything that dealt with Cancer until recently. But other then that my writing is my escape and my world so I can go anywhere I want to go with it. As Jane Powell, whom I interviewed for my book and is a writer herself, called it, “AFOG” – Another F-ing Opportunity for Growth.” She didn’t need one, just as you didn’t need cancer to be your dancing muse! But, gee, if it pushes you to be even more creative or to grow more, what’s the harm? Cancer inspired me to practice the craft of writing thank you notes, which I directed to the amazing friends and family (and even mere acquaintances) who sent gifts, etc. The gratitude practice may have brought others pleasure, but certainly made me feel better. Sure hope to see you perform someday! I LOVE that you did absolutely nothing with your photo transfer class. I did similar – ceramics, stained glass and a few others… just stuff that I did to do something during the shock after my diagnosis. Never did a damned thing with them. Great stuff. Go knit yourself a crazy hammock and have a nice snooze in it. Not everything has to have a purpose, ya know? I love the idea of the escapist world you talk about Ed. It reminds me of this incredible place called the Charlotte Maxwell Complimentary Clinic for low-income women with cancer (http://www.charlottemaxwell.org/). I was a client there when I was first diagnosed. In addition to having free alternative med. sessions, they had a few drawing classes. They were held at a large, lovely house in Oakland. We got to just roam around the garden and draw pictures. It was so utterly relaxing. And by the way, Christina, your hammock comment is priceless! Being crafty really does help get out some of my fibro angst. I tend to go the route of scrapbooking or other paper crafts. My favorite thing to do is to take a really inspiring quote and jazz it up on paper and display it on my desk! As a writer it is also hard to find balance. I often write about my cancer experience. I need to make more time to write about other things, fun things! My other profession is in healthcare. I am an OT and work in a nursing home. Since having cancer 8 years ago my job became much harder, having been in the role of “patient” for the first time. It changed the way I do my job, how I relate to my patients. It is very tough for me to work in that world as a cancer survivor. Sometimes I wonder if I will always continue to do it. I started getting artsy crafty before my diagnosis, taking writing, and photography classes. Then when cancer hit I could focus on nothing but being sick. I eventually got back to my craft stuff, my photography, crocheting, and recently beading. I find that spending an hour with my camera taking random shots of nature helps to shut off the constant crap roaming around in my anxious head. I like to make beaded jewelry and just give it away to friends, or wear it myself. It gets my focus off of the fear and I can be creative. I put too much pressure on myself at times like I have to do something with what I create, not feeling as if its good enough just to go through the process and have those things for myself or share with friends and family. On July 13th, I preposted my blog entries for to be published while I was in Canada with no Internet access from July 14-21! (I responded to your comment on my post on my blog). Just do like the rest of us, start a project and then put it away for some reason. You won’t be able to find it just like the rest of us. If you get bored let me know I’m sure I’ve got some unfinished crafts around. That being said, I was given drawing paper and those waxy artist crayons when I was diagnosed and when I had to go in the hospital with neutropenia I asked my husband to bring them. Cancer has in no way increased my artistic abilities, much as I wished it would. When I began chemotherapy treatments once a week, there was an art therapist who would visit my cubicle and help guide me through a collage-making process with the use of her large cart full of materials. When it was finally finished, we discussed what it meant and she gave me more and more to think about. It was like psychotherapy and art class mixed into one! I loved it! Alas, our schedules are different now and I never see her anymore. I’ve not been able to concentrate on the crafts I used to enjoy (cross stitching, knitting, etc) because I simply don’t have the attention span for it or the neutropenia makes my fingertips too sore to work the needles or my brain would really rather just watch some TV or play a game or go outside. I think if i had more guidance I would do more art. I’m writing like crazy all over the place: my blog, my facebook page, emails galore, as well as a memoir exercise book I picked up and immediately fell in love with. 2) the more I read about their similar experiences, the less “abnormal” I feel. Like they experience the same thing I do but they don’t have cancer so HEY it’s NORMAL to be this way! That gives me comfort. Since i’ve started doing that, I’ve learned a lot already! I just started last week. Thank you, Kairol for the inspiration!